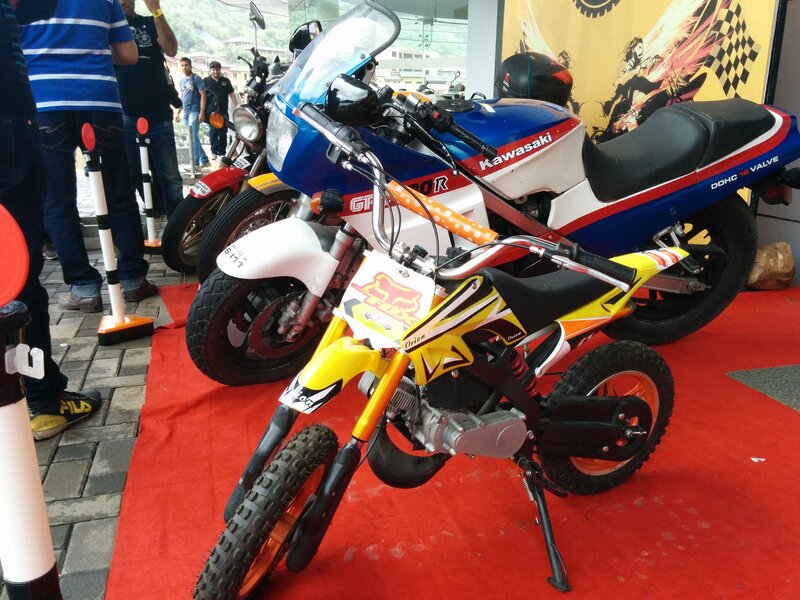 MotoDay or World MotorCycle Day is celebrated on 21st June every year. Why on 21st June? Well I am searching for the answer myself. If you have any clue please let me know in the comments section below. The only close to relevant answer I got is that 21st June is the longest day in the year and therefore you can ride a bit longer till the sun goes down. I will take this answer for now until I get a more relevant one. I did the online registration for it and then waited until Sunday (21st June) turned up. The plan was to start by 6 am and reach the meeting point at Chandani Chowk by 7 am. 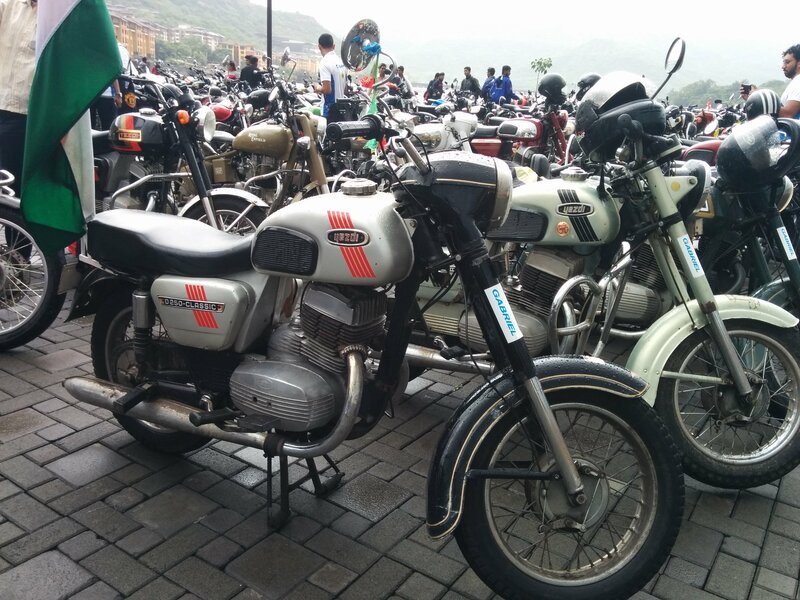 The riders would then ride up to Lavasa Convention Centre where meetups, speech by some riders, stalls and buffet was organized. Well, it was raining heavily since Saturday and Sunday was not any different. I was ready at 6 am and was sitting in the window wondering when the rain would stop. At a point I thought of dropping the plan, but Kalyan gave me the required push and I was out on my bike in the pouring rain. 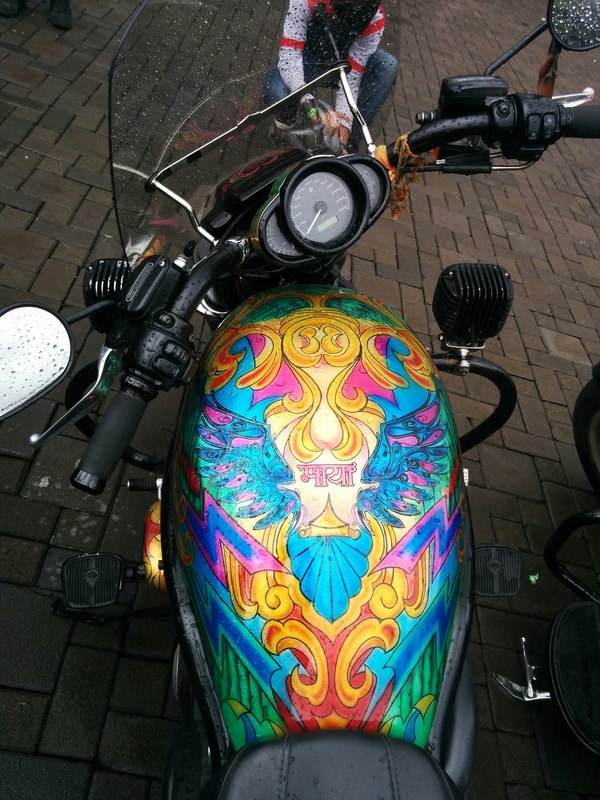 I reached the meeting point and saw quite a few RE (Royal Enfield) riders in small groups. 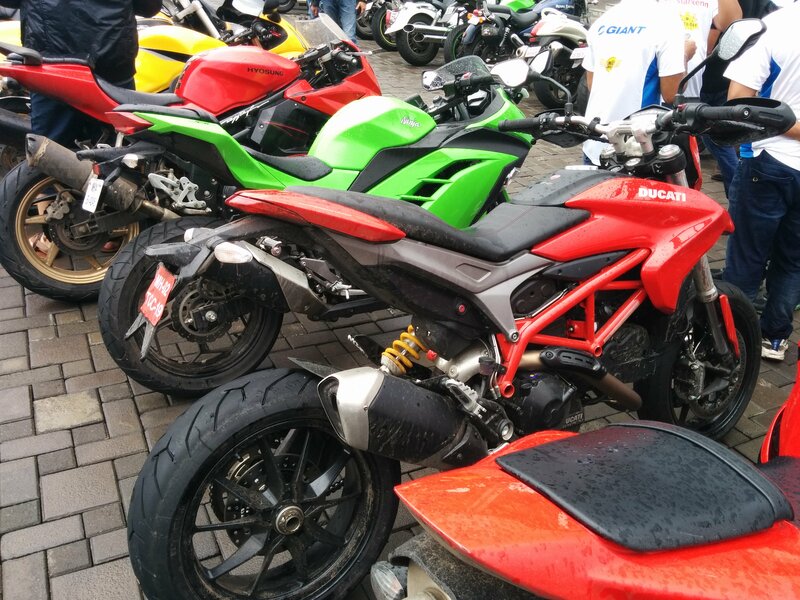 I believe RE groups are the pioneers of biking groups (clubs) in India. However, ironically there are too many of them now. I kept looking for Kalyan’s RE or any other bike or biker I knew, but no luck. So I started riding alone. Soon I was riding along with a small gang of RE riders. I drove with them for 20 mins or so and then they took a halt and I continued my ride. The rain now was bearable; enough to keep me wet but not bad to drench my clothes. I was at the foot of the ghat and I could see the mountains half covered with clouds. 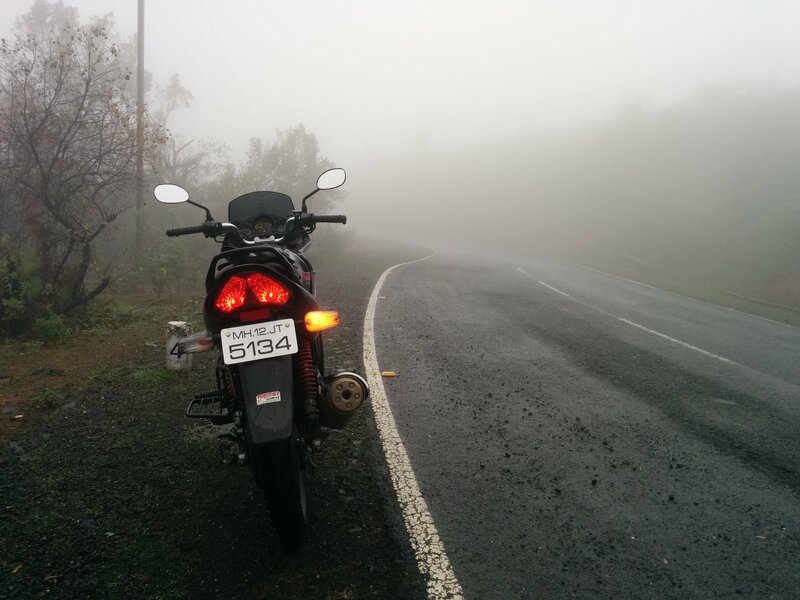 :D. I started climbing the ghat with a wide smile and riding in the dense fog. I stopped at a place to sip some water and to capture a few clicks. 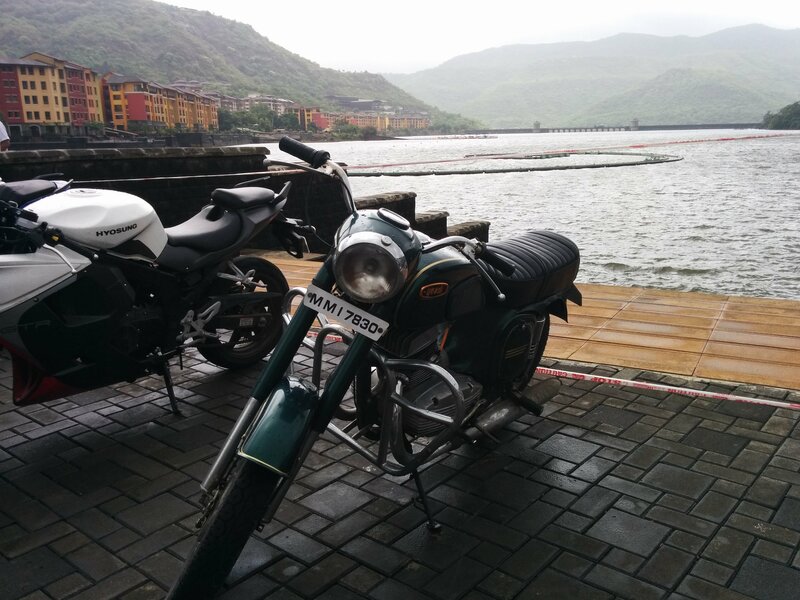 Reached the Lavasa city gate by 8 AM and I was stopped by a volunteer who asked to park my bike in a line among a few REs near the SMALL tea-snack shop that had a HUGE parking. I got off from my bike and stood among few other riders who were having tea and poha. Riders kept arriving and soon we were 50 or so in number. I walked up to one rider who was alone and looked alienated like me and greeted him. He was Tushar with his RE Thuderbird (TB) 350 who introduced me to another rider Shorat who rode RE TB 500. 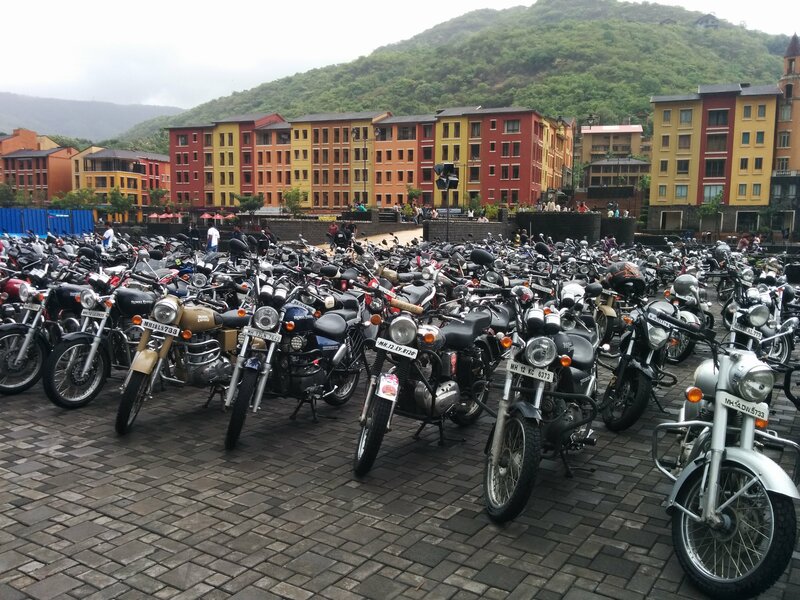 We reached the Lavasa Convention Centre and parked our bike in a guided formation. There was special parking place for Triumph and KTM, all so far empty. We went inside the venue and took a look around. 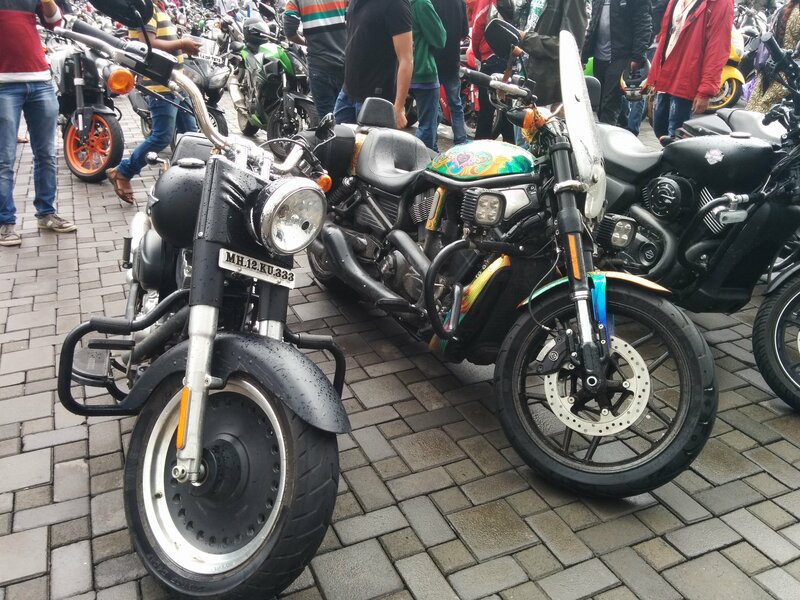 Again a special stall for Triumph, Ducati and some extensively modified bikes. We went inside the auditorium and saw that the stage setup was underway. The auditorium also had antique bikes parked on its perimeter. 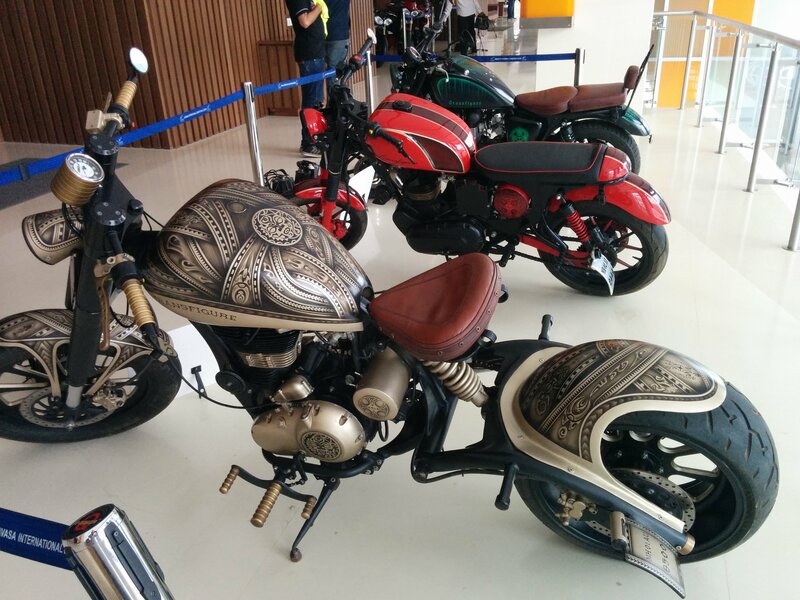 These were the same set of bikes that I saw when I visited the antique bike showcase a moth before at the Amanora mall, Pune. We inquired to couple of volunteers about the schedule of the program but they were not sure about anything except the Lunch time. All 3 of us headed out and were overwhelmed to see the number of bikes that had arrived in the meantime. 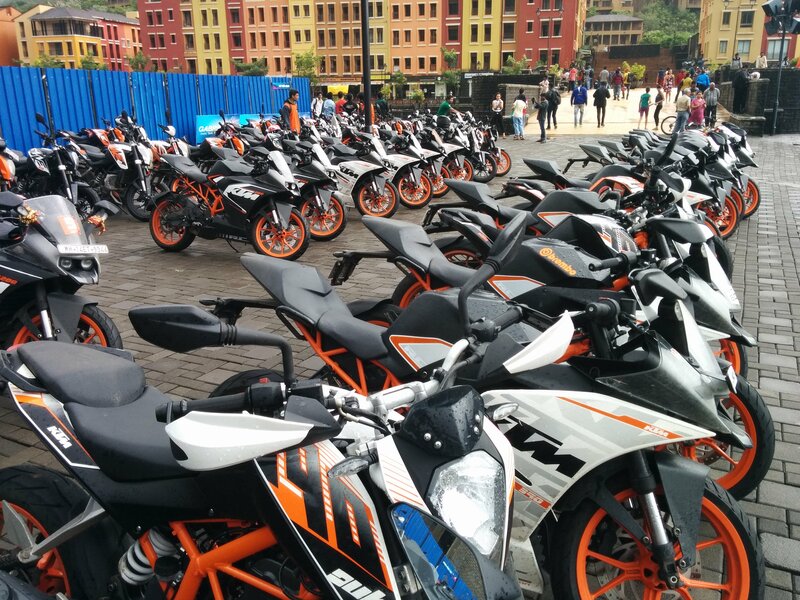 The Triumph parking had a good 20+ bikes and the KTM one looked like factory parking with 190+ bikes. 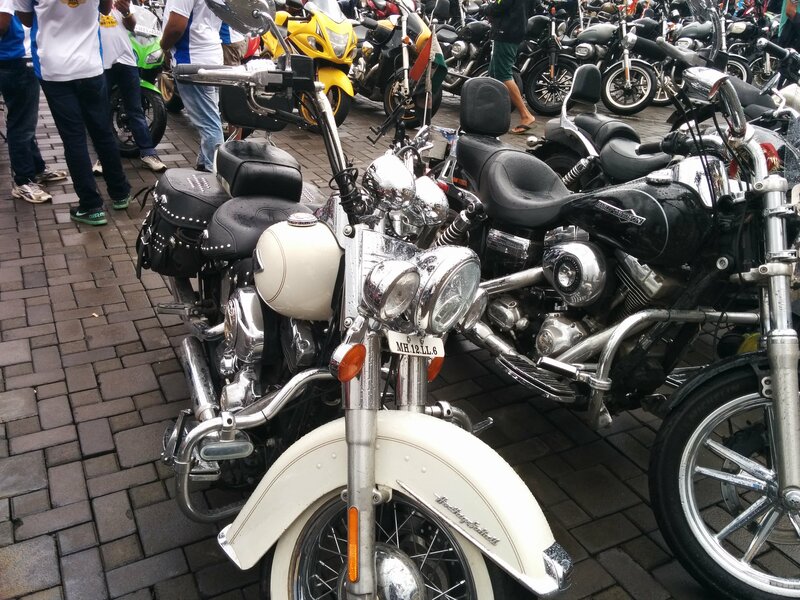 That was not all; there were roughly 500+ REs, 15+ Harley Davidsons, couple of Ninja’s and so on. Not to mention, Yamaha RX 100s and RD 350s. I heard from some volunteer that there were 1000+ bikes in all. There was a ladies riding group called Bikerni, who made a statement that riding bikes is a big passion for women as well. 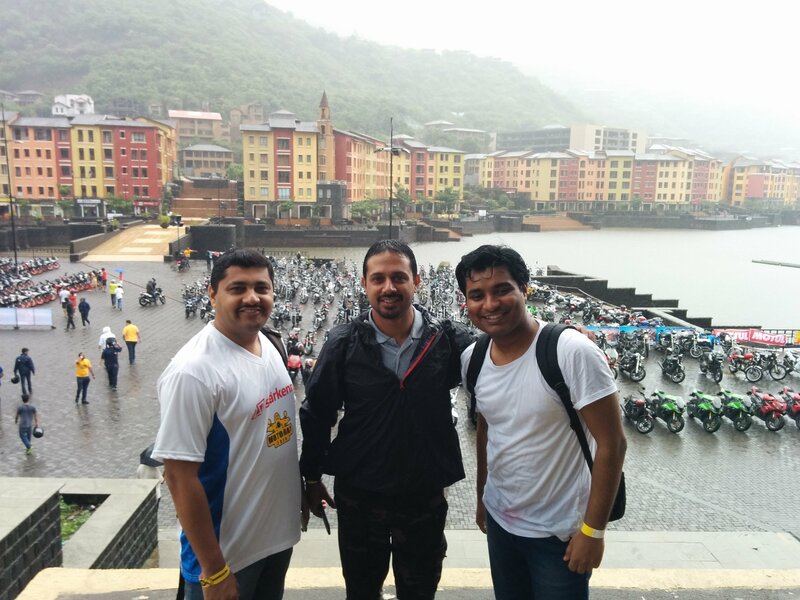 We completed our photo clicking, bike admiring sessions and headed to the buffet. Post lunch, we learned that the biker’s speech had happened when we were out clicking pictures. The Off-Roading and stunt show was cancelled due to heavy rains. What a shame! So 3 of us decided to leave and started riding together. We were riding in the rain amidst the fog. Tushar was quick and he zoomed ahead but me and Shorat kept riding together. 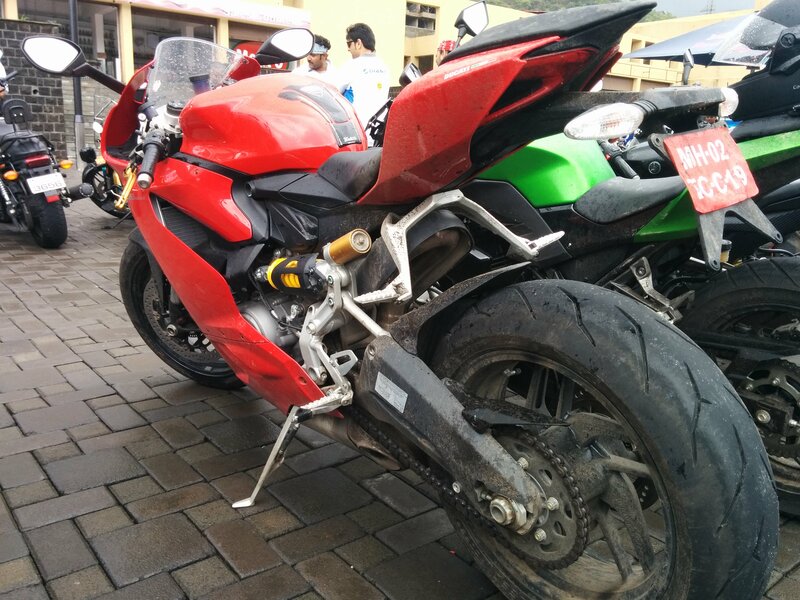 Riding in the rain is a different experience altogether. You have to seriously hold back the urge of going fast. Going fast is not a problem, braking on the wet road is! Hence this ride was a mixture of excitement and fear. On every turn, you have to make choices; how fast to enter the turn, the amount of pressure to apply on the brakes, how much to lean in and how fast to make the exit. To make these decisions you need to feel the road surface through the handle bar that tells you what is happening underneath the front tyre. The rear one just follows the line except when you have to brake hard, in which case it will tend to skid. You and your bike work together as a one machine, both relying on each other. As a rider you feel that that bike is an extension of your body. Throughout out the ride, your heart keeps going heavy and light. Mind is busy taking feedback, making decisions and screaming out loud …Oh yeah……….I am absolutely loving this!